It’s 7am and the crowds are beginning to arrive, weaving their way out of the darkness towards the blazing bonfire, flaming hay bales and wooden pallets warming up what would ordinarily be a very busy crossroad in the middle of the EU quarter, Brussels. Instead it has been occupied by farmers and their tractors, students, trade unionists, young and old, men and women, activists and those who feel it’s the right thing to do. The same thing is happening at other strategic crossroads across the Belgian capital, part of a day of action organised by the D19-20 citizen’s alliance which CEO is part of (for more info in English see here), formed to denounce the EU’s damaging neoliberal austerity policies and the secretive EU-US trade talks, negotiated behind closed doors between governments and big business. The D19-20 platform is the first time such diverse interests have worked together on these issues rather than apart, important for a country as decentralised as Belgium (three languages, four regions and as many parliaments as there are days of the week). The goal of the day itself is to blockade the European Summit, where our so-called leaders are meeting to discuss our future – but without our consent. If they are not prepared to listen to citizens – we asked for a meeting with EU Council President Van Rompuy, Trade Commissioner De Gucht and Belgian Prime Minister Di Rupo and were refused – then they should not meet at all. The blockades – our own and those set up by the police – are also kept entertained by agitprop activists as part of the Ctrl Alt EU campaign, highlighting how despite the spending cuts across Europe, the defence industry continues to receive handouts and subsidies. Ironic arms lobbyists give a big ‘thank you’ to DG Enterprise, present the EU with the Nobel War Prize, and give their tips on how to effectively lobby for more money and power. After the smoke clears and those involved look back, it’s remarkable what has been achieved: not just the successful blockade, but groups who have never worked together before finding common ground, building new links, and showing those looking on – who were supportive but unable to join – that the D19-20 Alliance can deliver and is here to stay, which means more support and a stronger voice in the future. This is important to all European citizens, Brussels being the seat of European power, home to the European Parliament and Council, as well as the undemocratic, unelected Commission, which is one third of the Troika and responsible for imposing austerity-laced bailout packages on struggling European countries. A strong grass-roots movement in Belgium can better hold to account and politicise the European institutions in their Brussels-based ivory towers. It’s also important in linking the struggle with other movements across the continent fighting the same many-headed neoliberal monster. 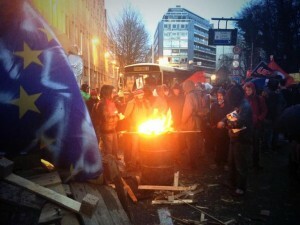 For domestic politics, the blockade brings issues previously not on the agenda to the fore: the European austerity treaty (know as the fiscal compact, or the ‘TSCG’ in Belgium) was being voted unanimously across Parliaments, whereas following the 19th December there have finally been some dissenting MP voices rejecting a law that will increase unemployment, evictions and the dismantling of the welfare state. Meanwhile, the EU-US free trade deal hadn’t reached the mainstream but through coverage of the day of action, the press has been forced to report it. 75 arbitrary arrests – some just unaware bystanders – and unprovoked police violence will not dissuaded citizens from rising up against austerity and governments captured by corporate lobbyists. Those involved in D19-20 – public and private sector trade unions, milk producers, organic farmers, women’s groups, NGOs, artists and radio stations among others (see the full list) – are already looking to the next steps: future summits, European days of mobilisation, reaching out further to allies across the continent. The day before the blockades saw Susan George lead an evening with speakers from across Europe – Greece, Spain, Portugal, Germany, Netherlands – sharing their experiences of austerity and how to build an alternative at the local, national and European level. The events here in Brussels on 19th December are an important part of that, especially for those involved who are seeing links across Belgian movements deepen. And if we are to fight this on a European level – which we must – it has to begin with strong grass-roots movements at local and national level, bringing together all those affected by our current suicidal trajectory, their plan to administer yet more of the same economic medicine that caused the crisis in the first place. But it’s happening. Bit by bit, it’s happening, including here in Belgium.